You need to hear The Avett Brothers, but perhaps this album isn't the best place to find your first impression. The Avett Brothers make quite a first impression. I've never seen any band -- certainly not one at a bluegrass festival -- destroy an instrument in their first song. Of a 45-minute set. On a beautiful spring afternoon that was recovering from rain. No one was surprised when four of said banjo's strings sprung and strayed around the tuning forks. 'Americana' fans of all ages and musical interests were drawn in by the sheer power, volume, and sweat of this first song. It hit your gut. I certainly understood why a number of friends sung the band's praises, and why even my ex-girlfriend made a point of telling me, "you must hear these guys" -- knowing, of course, she'd still, always, have to be right. Punk rock Americana that is fast, loud, sweaty, screaming, and fearful of no conformity. These are the strengths of The Avett Brothers, a trio from some small North Carolina town. They work hard. They've made several records – about six total, individually and as a group – on a small label, building a near-obsessive local following and a regional reputation for unforgettable live show incidents. Their newest record, Four Thieves Gone: The Robbinsville Sessions, opens with "Talk on Indolence" and is poised -- like the song itself -- to explode the group into un-chartered territory. Exposure? On the band's MySpace page, you'll find hometown friends bragging about buying Four Thieves Gone off the shelves of Greenville, North Carolina, chain stores. Country Music Television's web site has a blurb feature, and the band recently guested on National Public Radio's World Café. Pollstar put them on their cover. BR5-49 is bringing them on tour. Indeed, in the post-show glow, Four Thieves Gone will sell many units at the merch table. This attention is deserved. However -- unfortunately, sadly, regrettably -- this record isn't indicative of The Avett Brothers' best work. It doesn't capture the strength of their live shows -- but neither did the recent release Live, Vol. 2, which mostly only captured the room in which it was recorded and the screaming passion for which local crowds follow these fellas. This new record will, however, get more exposure than any of their previous records, including 2004's much stronger Mignonette. Sing-songish, skittering, percussive, gritty, resonant, playful, jaunty, joyous -- these are the adjectives that best describe the band's highlights from past albums. But they rarely apply to Four Thieves Gone. The Avett Brothers care enough about their music to place technical proficiency in the backseat, while letting impassioned strumming, off-key singing and off-mic screaming drive home just what they mean. But, to me, these strengths are better embodied in their mid- to up-tempo songs -- and Four Thieves Gone is weighted down by slowness and drawn-out harmonies. This is a band that excels when it colors outside of the lines, and it is their previous albums and live shows that best showcase their bright and fast Crayola scribbling. Their intensity just isn't as prominent on the blue -- and yet not blue- sy -- tinted songs that predominate this release. On Four Thieves Gone, the rapture of the first track is followed by a mellow piano ballad, "Pretty Girl from Feltre" -- creating an effect as drastic as leaving a New Year's Eve party to attend a midnight funeral. In fact, the album's overall sequencing is poor, and the next 45 minutes bring 17 total songs that never build to a consistent pace. "Matrimony" has all of the excitement of the opener, including some well-placed hand-claps, but suffers from the lame and distracting rhyme of "hand/man/can." Simple can be good, simplistic can be bad. The best and brightest songs on the album are the heavily strummed ones with ramshackle harmonies, like "Talk on Indolence" and two buried at the end, "Gimmieakiss" and "November Blue Denounced (Uneasy Writer)." 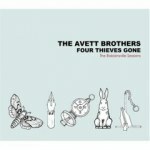 In fact, my ultimate wish for the Avetts is found within the first words of another album highlight, "Colorshow": "Be loud / Let your colors show..."
Four Thieves Gone doesn't present the colorful spectrum of The Avett Brothers' strengths, and the highlights are too few and far between for me to wholly recommend this release. Perhaps this album review is actually a disguised recommendation to see them live. Ultimately, I guess my ex is right, after all: "you must hear these guys." And I hope your first impression involves some heavily strummed -- if not broken -- banjo strings.